Hi all! This has been the longest gap between posts so far. I apologize. My intentions are to write at least once a week, but that didn’t happen last week. I’m here now and I guess that’s what really matters!! 🙂 I’ve done a lot of crafting lately. I won’t bore you with picture overload, but I will share a few cards I recently made. 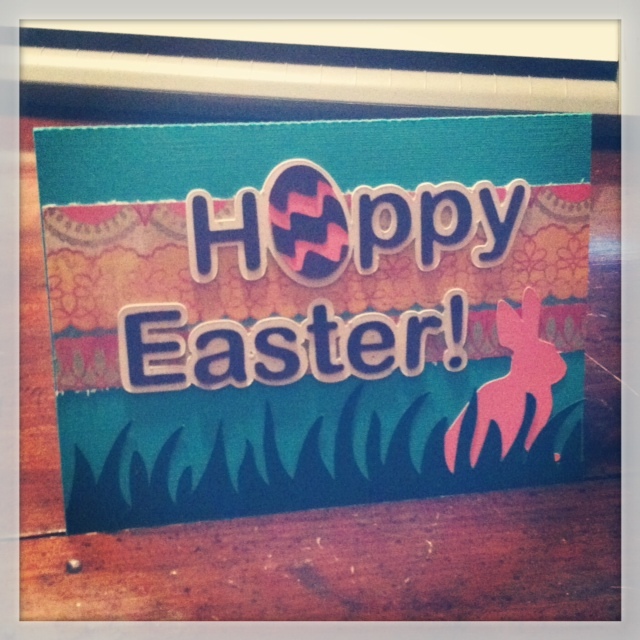 Here’s an Easter card I made for a few family members. They received it today and loved it. This is one of my favorites so far! The bunny and grass are from the Silhouette Online Store. The bunny was one of the free images of the week. I thought it turned out pretty cute. 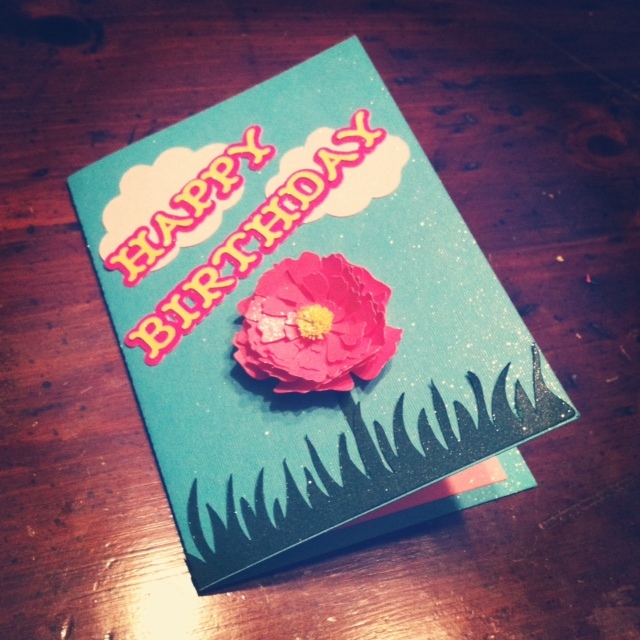 My next card is for my grandma’s 72nd birthday. The flower image is another free download of the week. 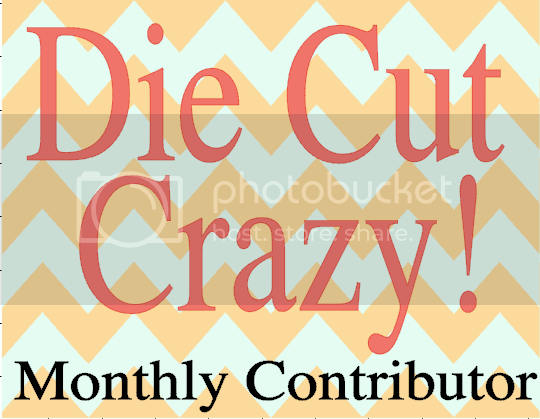 It’s actually this weeks free image, so if you haven’t grabbed it yet you should! I did mine smaller and didn’t use all the petals, but I really liked how it turned out. She loves to garden and I know she is looking forward to planting her flowers this spring/summer. I hope she loves it! I sprayed some glitter spray on top to give it a little sparkle. I like it, but wish I wouldn’t have sprayed so much! -A little goes a long way- The grass is the same grass from the other card. I think I’ve used it in the last 3 projects I’ve done! Easter is coming up! Guess who’s excited? ME!! Easter Sunday we are leaving bright and early and heading out on a family vacation! I am so ready to get some alone time with my sweet guys. We live in Northwest Arkansas. It’s beautiful here in the Ozark Mountains, but we wanna go to the beach!! We are heading to Florida! Sunday we leave and will drive about 10-11 hours to stay the night with my cousin in Mississippi. She has lived there for a while now and we haven’t made it down to see her yet. That’ll be a nice place to stop, let the kids play and get some good rest. Monday we will drive on towards Florida and stay until Friday. Did I mention we are taking the 2 kids AND Lucy our dog? This should make for an interesting and unforgettable drive!! I am so ready to hit the road and see all the sights. As for the next few days I will be doing laundry, cleaning house, and packing. No fun at all. 😉 I promise to post while we are gone. I want to share all the pictures and any fun stories that come along. Thanks for reading and I hope everyone has a great Easter!! P.S. Today is Marley’s 13th birthday. Well…the 28th, it’s officially Friday here since it’s past midnight. I can’t believe she’s a teenager!! Kids grow up so fast. 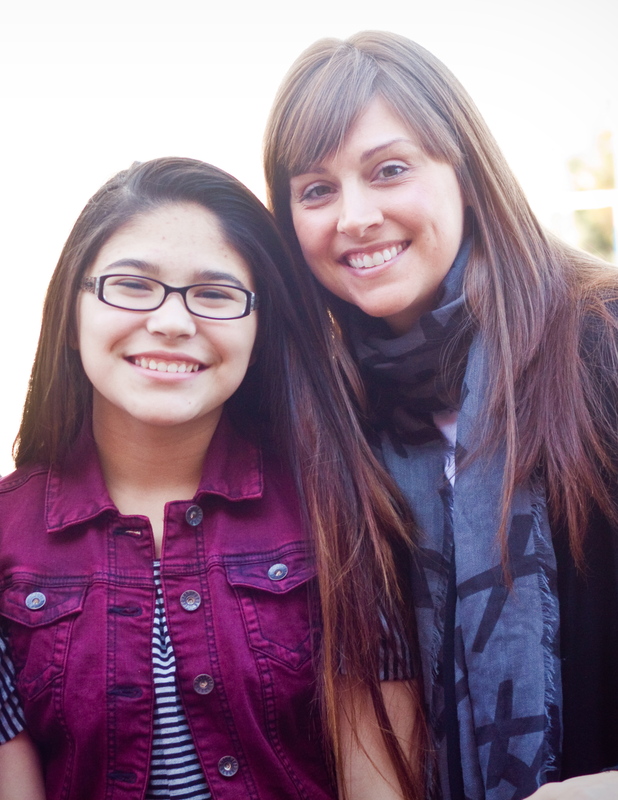 I am so thankful I met her dad 11 years ago and had the opportunity to be this beautiful girls step-mom. She is the best big sister the boys could ask for and we can’t wait for her to come stay with us this summer. Love you Marley!! Today was such a beautiful day. It was the first day it actually felt like Spring. I know we still have 4 more days, but I am so ready!! It was nice letting the kids run around outside with NO jacket, Jeremy worked out in the yard, and we ran some errands. Sadly I will say I was stuck inside for most of the day…working on projects and cleaning house. I still enjoyed the sunshine through the windows and the peace and quiet. With spring coming up, that means a couple of things for us…one of those being guests. We live in a tourist town (which is amazing) and get lots of visitors spring through fall. 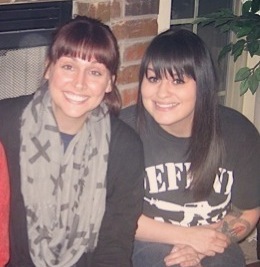 This weekend…one of my best friends, her kids, and her fiancé. I am so excited to hang out with them tomorrow. The St. Paddys Day parade is at 2…can’t miss that!! The weather is supposed to be nice again and I’m sure the boys (my 2 and her 2) will love playing outside together. Next weekend my mom will be here and Easter weekend we are leaving to go on vacation. I am really looking forward to all the guests we will have in the next few months, but I also know we will be very busy. I will take pictures tomorrow and try to get them up here for all of you to see. Sorry for the short post. It’s late…I have to get up early…I need some sleep. Have a great weekend and I hope your weather is as nice as mine. 4 days until spring!! Today is the day, I turned 30! I can NOT believe it either….I will admit, so far it is amazing! 😉 I feel like every birthday just gets better and better. I had an amazing day with my family. We walked downtown. (It was so beautiful today!) My dad and step-mom called and said “Go pick out whatever you want at the Rocky Mountain Chocolate Factory.” Hello!! My kids were in heaven. (and hyper all day long!!) We had a great lunch at The Balcony Restaurant. Walked back up hill to the house…I could barely breathe once we got home. Once I caught my breath, we enjoyed the nice weather outside and let the boys run wild in the yard. 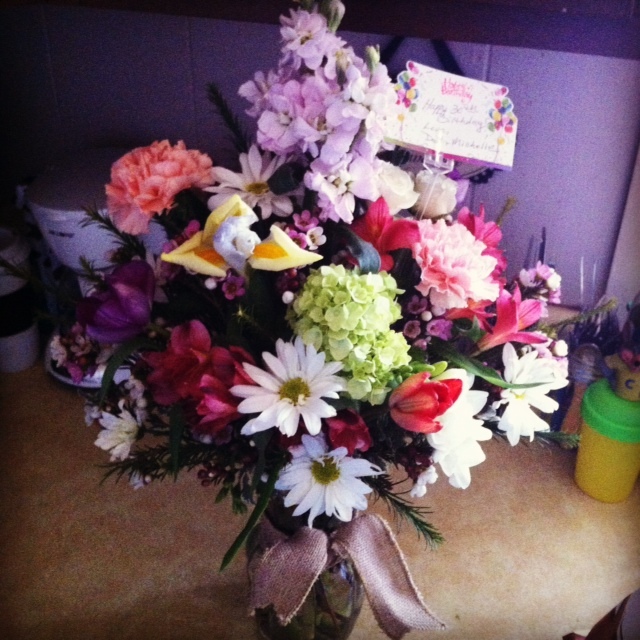 Look at the beautiful flowers I received!! I don’t remember the last time I’ve gotten flowers. I was so happy. 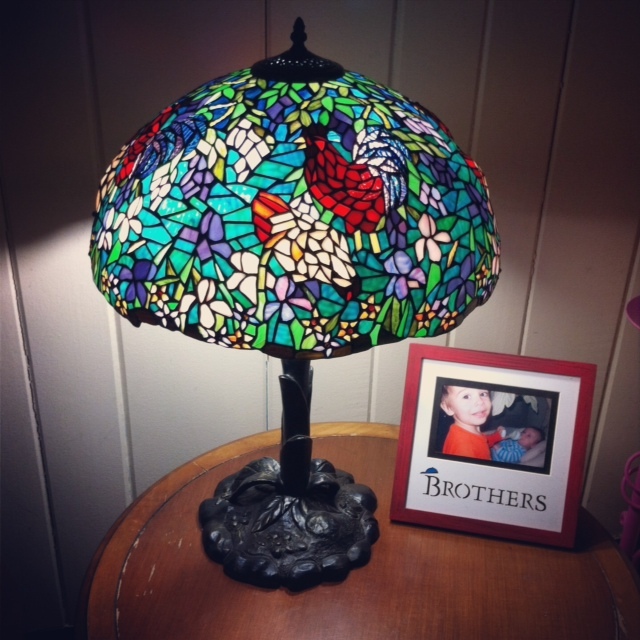 Not only did I get the flowers…I also got this AMAZING lamp!!! I am in love with this lamp. I had been eyeing it for a while now. I am happy to say…with birthday money…I finally got the lamp I wanted to so badly. I had the best birthday today.